I can still remember my first experience watching the Harlem Globetrotters. Grant it, it was pretty unique. One of my friend’s grandfathers was a retired Harlem Globetrotter. He came and did a mini exhibition at our elementary school. I think my mouth was opened the whole time. I vividly remember some of the stunts he did 20ish years later. Now that my boys are a little older, I think it is time to expose them to this insane talent. Or maybe my husband and I are using them as an excuse to go! At the bottom of this post there are links for 25% off! Hope you take advantage and take some kids/family/friends! I am so excited to announce my first giveaway! 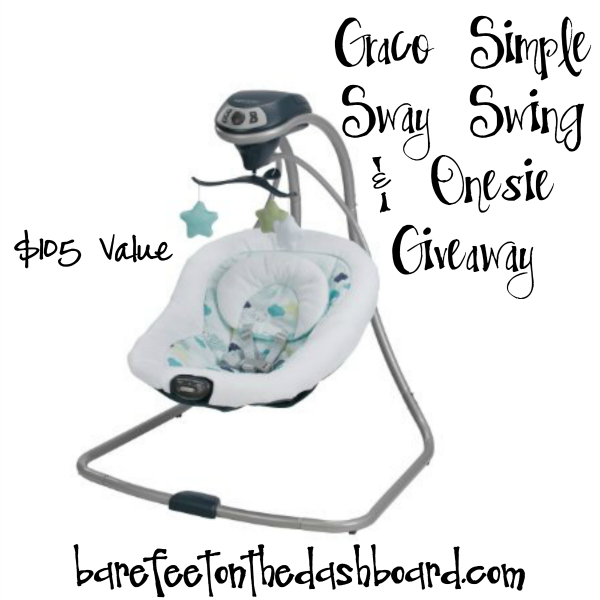 I am partnering with Bare Feet On the Dashboard and we are giving away the Graco Simple Sway Swing and an Organic Onesie. Baby swings are such a wonderful invention. Ours was a lifesaver with our babes. Sometimes our swing was the only way our babies would sleep. This swing will be an extra set of hands for you. Before I was a mom, I did not think a swing was necessary. In my idealistic pre-mom mind, I only wanted to have a few baby things. We were also only going to use cloth diapers and have mainly wooden toys. I can laugh at my thinking now. All of those things are great, but before you have a baby you don’t realize how much sleep you lose and how nice it is to have help. Thankfully my mom knew better and got us a swing the week before my first son was born. I have such sweet memories of getting to drink my coffee after a long night while watching my first born sleep in the swing. I also was able to cook supper and eat it with both hands because of our lovely swing. We used our swing so much when our boys were babies. Sometimes I wish I could still put them in a swing and let them be lulled to sleep, ha! Enter bellow for your chance to win! If you have a new baby or one on the way, we’ve got the giveaway for you. A baby swing will help soothe your little one, become the perfect place for naps, and allow you to eat dinner with BOTH hands. That, my friends, is a luxury when a new baby comes along. Enter to win an awesome Graco® Simple Sway™ Swing and organic Graco onesie from Bare Feet on the Dashboard using the Rafflecopter form below. If you have trouble seeing the giveaway entry form on your mobile device, please visit this link to enter or switch to classic mode. I am so on top of things. So on top in fact, that I just took down our thankful tree from this Thanksgiving. To my credit, I have had our Christmas decorations down for a solid month. Part of the reason I left the tree was because during the winter months, the art of giving thanks is just harder for me. It was 10 degrees this morning with a windchill of -6. That means that it actually feels like -6 outside. That is bone chilling cold. My lovely and wonderful sister in law (also one of my best friends) makes fun of me for always mentioning the windchill. What can I say, she knows I’m a cold weather wimp and now you do as well. When it is cold and we can’t play outside, I start to long for spring and summer and wish these cold days away. It is easier for me to complain than to remember all that I have. This Thankful Tree was a craft I did during MOPS (Mothers of Preschoolers). I highly recommend MOPS by the way. We made the tree and then cut out some of the leaves during our crafts workshop back in October. The idea of the tree is to help promote a home that is thankful. To voice that we are thankful for each other, for time together, for sweet specific moments with our children (loved ones), for experiences we share, and for things that we already have. My children are so young that they didn’t fully grasp what it meant, but I do believe little seeds were planted. This tree was still so good for me to do. As a mom, I believe we set the tone of our home. I’m striving for contentment which is very opposite from our culture. I love my husband and his sense of humor. His first leaf said “Thankful for a wife that is all about that bass!”. I wrote down what my boys were thankful for. It will be fun to look back and remember how much they loved playing hide and seek and how they loved to be held close while we read to them. These things are gifts and are worth remembering. I’m actually contemplating making a Flower Thankful Wall (just doing the same thing with flowers). I may wait a month to do that because I am loving the clean wall. I haven’t done this yet, but I will: laminate the leaves, punch a hole in them, and put them on a ring. This will be a new ornament for our Christmas tree next year. I would love to hear how you help set the tone for your home. Do you have any ideas to help raise kids who are thankful? I would love to hear them. One afternoon last spring, I was making lunch for my sons. It was a day that I was scrapping by with what groceries we had. It was just too pretty to drag them to the store that morning. When lunch rolled around, I had to get creative. And thankfully I was hit by a sudden stroke of genius. Neither one of my boys was a sandwich eater. I tried so many times, but they just never went for them. Well, this idea changed that forever! I slapped some PB and honey on bread and then used a cookie cutter to make them into fun shapes. My kids ate them up. Literally. My boys dug in and are now sandwiches eaters. Not only was it an easy way to get them to eat, but it also made for fun lunch topics. “Can you show me the elephant’s trunk?” “Can you nibble at the elephant’s leg?” “What do you think elephants eat?”. As time went by, I had more fun with it. We practiced our shapes when we ate sandwiches. You don’t need a cookie cutter to cut them into triangles, circles, rectangles, diamonds, and squares. I also have snowflakes for snowy days and leaves for the fall. Right now I use hearts for Valentine’s Day. Plus, we talk about where our hearts are located and what sounds they makes. Now that both boys are a little older, they help me make the sandwiches. They love to pick which shapes to cut them into. An added bonus is now they know they like them. So if I’m in a rush, I don’t have to use a cookie cutter. What are some creative ways you’ve gotten your kids to try new foods? What are some of your go-to table conversations? Thank you for reading! The end of January is here, and that means Spring is that much closer. It also means Valentine’s Day is coming up. Here is a SUPER easy Valentine’s idea. I plan on sending these pictures to Grandparents in a cute frame or maybe just in a handmade card from the boys. Here’s how you make lights look like hearts. You won’t believe how simple this is. 1.Tack up some christmas lights. I used icicle lights with white wiring so that they blends in with the wall easily. I also used clear push pins to secure the lights to the wall. 2. Cut out a lens size circle and in that circle cut out a heart. 3. Tape that on your camera lens. 4. Set your cute models up and start snapping pictures! You might have to play around with your camera settings. I found the best results by having my boys closer to me (the camera) than the wall with the lights. I had my aperture very low (1.4-2) which does fun things with the lights in the background. After I readjusted the cut out heart (it was interfering with my camera’s auto focus), it was game time. The shots came out so cute. I am excited to send them out to my parents and in loves (my in-laws) for a fun valentine’s surprise. I practiced a bit on my pup, Mako. He was a good sport, but did get a little bored after he saw no ball throwing was involved. It was easier to practice on him since he will sit still. One of my boys will be 3 in a few months and the other is 19 months…. so they don’t sit still for long. Seeing how I’m new to this blog thing, you might expect for me to talk about my faith, husband, or sweet babes. But no I chose for my first post to be about a different love. My love of reading. I have always known that I love to read. My mom and dad read to us most nights when we were little. I remember my dad reading the most because he used awesome voices and was so very animated. I can still hear his Reepicheep voice from Narnia. Somehow during our first years of marriage, I just didn’t read as much. Well this last year I made it a resolution to read more fiction. Why fiction? Because I freaking love it. I wanted to do something for the pure enjoyment of it. So fiction it was. In 2014 I read SOOO many books. January started out with some Francine Rivers goodness. A couple I had read before and then some newbies. Then I got addicted to The Outlander Series, The Divergent Series (Lord help me), and The Wingfeather Saga. Usually I read book series. It’s fun to get to know the characters on a deeper level that way (NERD ALERT!). Anyway, I think I probably aged a couple years in the last year because I would consistently stay up till 2 in the morning reading. I have 2 small boys who are 14 months apart. So was this wise? Absolutely not. I had to be on at 7 or 730am or whatever time they woke up. So yes, I probably aged some with lack of sleep. But I was thoroughly enjoying myself. Recently, I read an article about how people who read fiction are better friends because they are more empathetic. My friends and husband should feel pretty blessed, ha! Anyway the article used a study from Emory University where they compared fiction readers vs non readers’ brains. Sounds pretty legit, if you ask me. Hmmm, well because it’s been on my mind. That’s what I will mostly be writing about on this blog. Anything that’s been on my heart or in my head that I think is worthy of sharing. Plus I think it’s so important for us to read so that we can be examples for our kids. Both my boys LOVE to read. I think because since they were able to hold there heads up my husband and I have read to them. We want our kids to be empathetic friends right? Carve out time on the daily to read. Reading before bed is a great idea and can create a nice “bedtime routine”. Reading when they first wake up can be a nice way to get some snuggles in while they are still sleepy eyed. Really you don’t have to be schedule-y about it. It could be a fancy reading nook or a comfy pillow on the floor next to a basket of books. I have always had a basket of books next to their rocker. We have books in a few places. I just want it to be easy for them to grab a book. It is so fun to walk into a room and see their sweet little noggins in a book. Sometimes it would be so much easier to just plop them in front of a screen instead of read to them. If one of my boys is cranky, 9 out of 10 times a book will help set them back in a better mood. They love interaction with us and they love to be close to us. So reading just makes sense. And don’t get me wrong, there is definitely times where we need a little Daniel Tiger or Curious George. This sounds complicated, but it’s just not. My kids have their favorite books that they could read over and over again. I will keep those out. I will put the books they haven’t looked at in awhile away. That way it is less clutter in your home, plus it gives the books novelty (get it, haha) when you bring them back out again. You don’t need to buy every book brand new. Find a good 2nd hand store close or go to the library. Ask for books as presents. Some of our favorite books have been given to us by friends and family. There are so many places to get books. So what are your all time FAVORITE books? I need to add them to my list. What about kids’ books? Any other reading thoughts?